That ragpile on the path is trouble; it just happens to be a man. Jasminda doesn’t need trouble. She’s on her way home from a trip to town and worried about losing her home, being asked to disown her mother, and being treated differently just because her skin is a different color and she can use Earthsong. Her father was Lagrimari, a refugee from an evil and seeminly eternal tyrant. Now Jasminda has one more thing to worry about: How to save Jack, an Elsiran, whose mission may mean a lot more than life or death. It may mean the end of divided countries and the awakening of a Queen who has slept for centuries. This story is just utterly fantastic. L. Penelope has wrought a complex storyline, woven in memorable and believable characters, created a world that flowers before us with life, history, and character, and simply forces us to live in Jasminda’s and Jack’s minds. Many tough subjects are tackled, including racism, sibling love and rivalry, a sovereign’s power and lack thereof, and much, much more. Even better, it’s all done in a story that captivates and enthralls with a lot of action and peril. Just a really excellent read all the way around. Song of Blood & Stone (Earthsinger Chronicles) will leave you thinking long after you finish reading. Highly recommended with one caveat: I would recommend for 17+ due to sexual content. I received this book as an Advanced Reader Copy (ARC) through NetGalley. My opinions are my own. 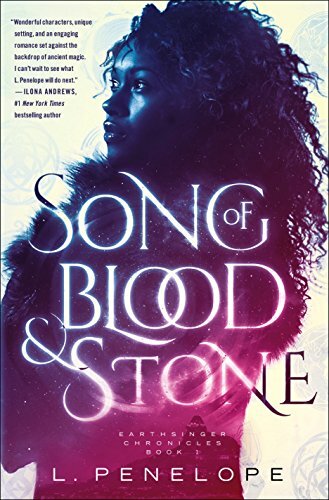 L. Penelope’s Song of Blood & Stone is a treacherous, thrilling, epic fantasy about an outcast drawn into a war between two powerful rulers. Jack’s mission behind enemy lines to prove that the Mantle between Elsira and Lagrimar is about to fall nearly cost him his life, but he is saved by the healing Song of a mysterious young woman. Now he must do whatever it takes to save Elsira and its people from the True Father and he needs Jasminda’s Earthsong to do it. They escape their vicious captors and together embark on a perilous journey to save the land and to uncover the secrets of the Queen Who Sleeps.